I just went to the Market at Stitches West with some friends last weekend. Though I haven't done any real knitting in many years (I used to be a serious knitting addict before I started having hand problems), I enjoyed it quite a bit. 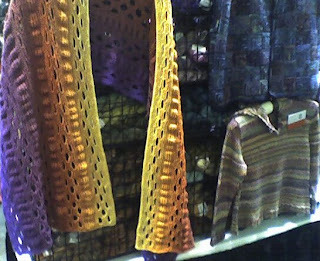 Picture about a hundred yarn and related stores all crammed into a convention hall, with all their yarns draped beautifully amid the knitted-up sample sweaters and scarves and socks. 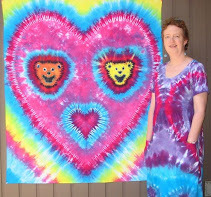 Yup, just like tie-dye, it's all about COLORS, and lots of them. I particularly liked the offerings from Strickwear.com. Candace Eisner Strick, the designer, has a really wonderful sense of color and design (that rainbow stole in my photo looks much better in person and on her website). One thing I noticed that is different from when I had gone before (several years ago) is that hand-dyed, variegated yarns are really dominant now. 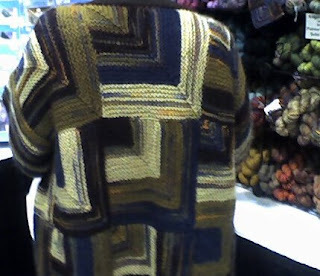 It makes sense if you think about recent trends in knitting. The average knitters are younger than before, but have lots of other things to do. So simpler patterns to knit (such as plain stockinette knitting) and easy, small projects to complete, such as socks and scarves, are more important. Variegated yarns provide lots of colors in a project (here are some more examples) without the knitter's having to deal with multiple balls of yarn (or two, at most) and switching colors in and out. You also don't have to choose your own color combinations--it's already professionally chosen for you, right in that one skein of yarn. And finally, in a setting like Stitches, those gorgeous hanks of brightly-colored fibers are really eye-catching and display very well, drawing the shopper from across the hall. So do the sweaters, either on the displays or on the shoppers. I really enjoyed the display booth from Mountain Colors Hand-Painted Yarns. They had their entire line out for fondling! 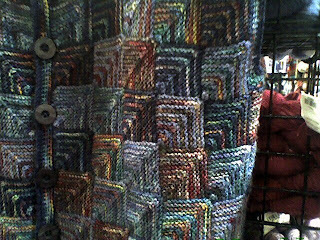 Many of those hanks looked like they had been tie-dyed, and the Mountain Colors booth even showed photos of their people dyeing their yarns with squeeze bottles--it looked a lot like my tie-dyeing! I've been thinking (a little) about getting some white wool and dyeing some myself, and many others have as well. Dharma even carries yarn for dyeing.